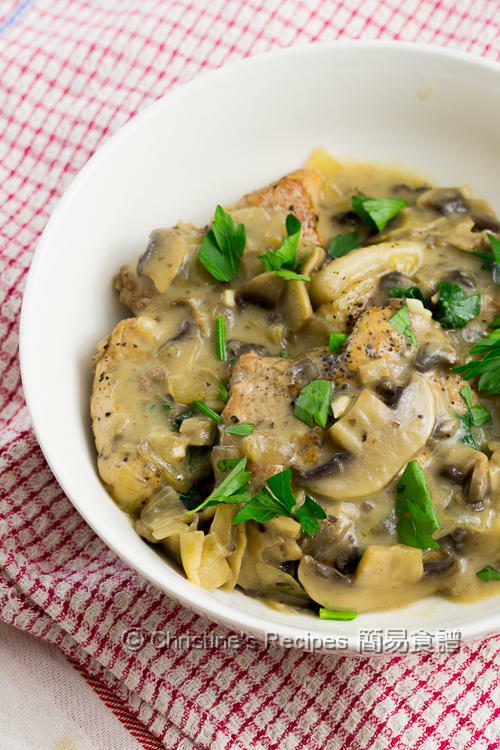 You need only one pot, that’s Instant Pot to make this delicious and juicy pork chops with creamy mushroom sauce. Fuss free and mess free in the kitchen. Oftentimes pork chops are tough and leathery after cooking. Any workaround? If using the wrong cuts or over-cooked, you might feel like wasting all the money to get the pork chops. To get the best results, try to get pork chops with more fat as fat makes meat tender. Fat?! This word scares many people away. Wait, the par-cooking process (aka partially cook beforehand) using pan-frying method will help render the grease out of pork chops. Best still, par-cooking produces a beautiful brown colour on pork chop surface, increases aroma and adds more flavours. On top of that, I found another method. This recipe can be taken as another tested workaround. 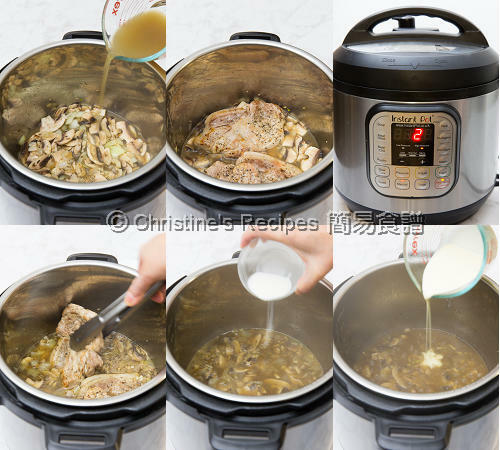 The high pressure inside Instant Pot (electric pressure cooker) can make the pork meat tissue softer. Only 2 minutes of cooking time are just enough (not counting in building up pressure inside or releasing pressure time). This dish is so easy to make. 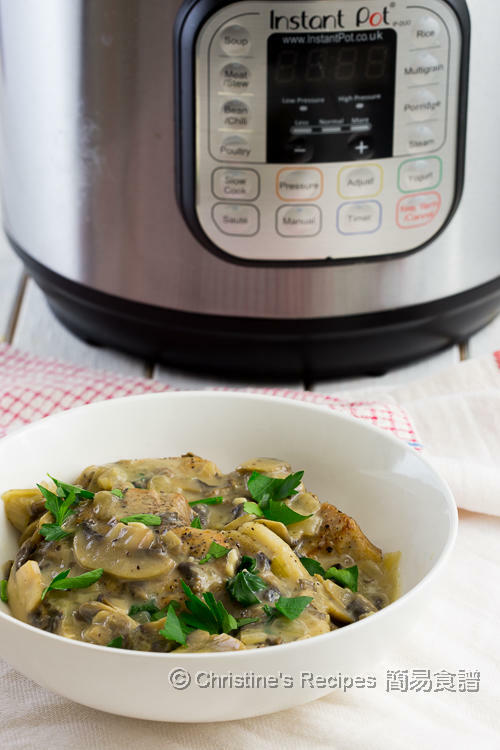 Give it a go if you have an Instant Pot. If you still don’t have one, it might be the time to get one. Rinse pork chops and pat dry with kitchen papers. Pound the pork chops with the back of cleaver or meat mallet. Don’t skip this step. This step will help to make the pork chops tender. Season both sides with salt and pepper. 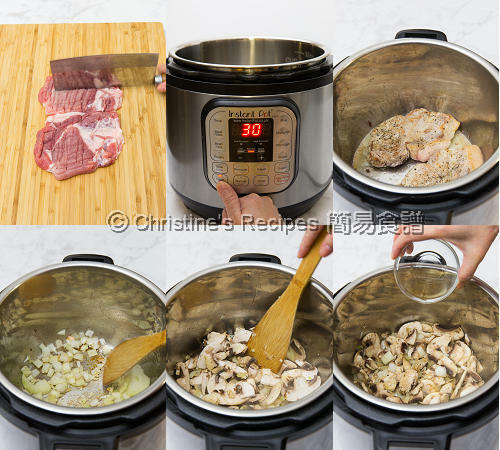 Prepare Instant Pot. Press “Saute”, medium. Heat butter and oil. Cook pork chops until both sides are lightly brown, about 1 - 2 minutes for each side. Set aside. Cover to keep warm. Add some more oil if necessary. Saute garlic and onion. 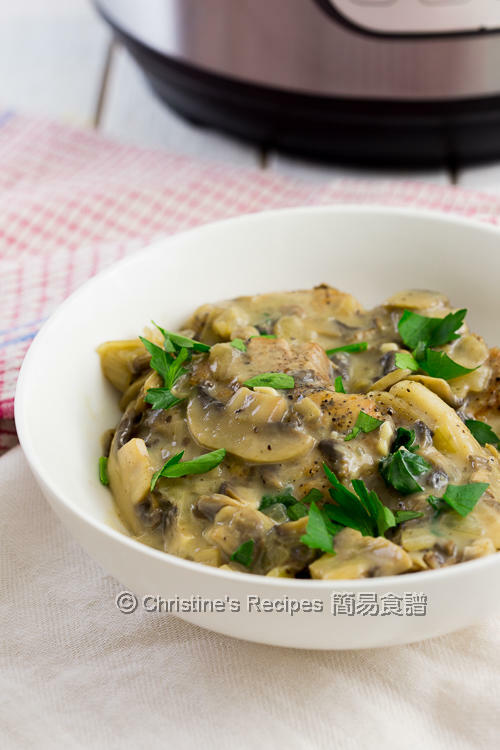 Add mushrooms. Cook for about 3 minutes. Pour in white wine. Use a wooden spoon or spatula to scrape the delicious brown bits at the pot bottom. Pour in chicken stock. Toss back pork chops. Let the sauce cover the pork chops. Cover and turn steam release handle to the “Sealing” position. Select “Manual”, “High Pressure” cooking for 2 minutes. Naturally release pressure for 10 minutes. Quickly release pressure by turning steam release handle to the “Venting” position. After the float valve drops down, remove the lid. Dish up the pork chops. Cover to keep warm. Press “Saute” and cook until the sauce reduced by 1/3. Stir in thickening. Cook to preferred consistency. Press “Cancel”. Stir in cream and parsley. It’s done. Serve hot. You can make this dish without an Instant Pot, over a stovetop instead. You need to adjust the stove power and cooking time accordingly. This time I used pork sirloin steak that are quite lean. The end results was quite satisfied with juicy meat. That looks super yum! Have never thought of using IP to make pork chops. Excellent!